Wed., Aug. 10, 2016, 3:55 p.m. 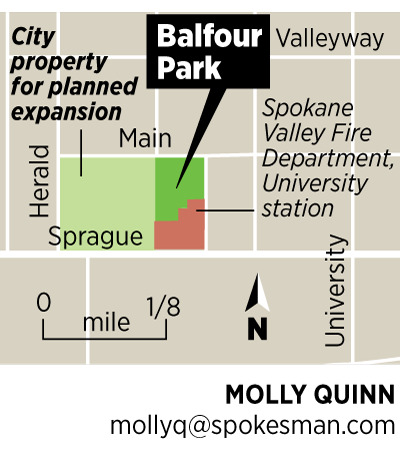 The Spokane Valley City Council is considering whether to ask the state for $4.5 million in funding to expand Balfour Park, but the idea met some resistance Tuesday. The city bought 8.4 acres at Sprague Avenue and Herald Street with plans to expand the adjacent Balfour Park. Three acres were sold to the Spokane County Library District for a new library branch, though the library district has asked the city to buy the property back. No funding was set aside for the park expansion. Deputy Mayor Arne Woodard said the city might be better off if it asked for money to complete the park features on the first phase of the Appleway Trail that was built last year. While the city has secured funding for future phases of the trail, the first phase was built entirely with city money and is little more than a paved trail. “That would be a much smaller ask,” he said. Briahna Murray, Spokane Valley’s lobbyist, said she would recommend the city ask for funding for a project that has community support and is ready to go. Mayor Rod Higgins said he didn’t think the Balfour project was ready. “Right now we’re not even sure what the library is going to do,” he said. However, in June the library board voted against putting a third bond measure on the ballot and announced it wanted to sell the land back. The city sold the library district the land with the condition that if the district couldn’t pass a bond to fund construction of a new library the city would buy the land back. Two attempts to pass a bond failed. Council members discussed other items they want to campaign for in Olympia, including funding for an overpass over the railroad lines on Barker Road. Pace said he wanted to lobby against rule making by “unelected bodies” such as the Department of Ecology and the Human Rights Commission and instead take away their power and give it to the Legislature. Murray advised that she didn’t see “a path for success” for that proposal in today’s current political climate. Councilman Sam Wood said he’d like to target the state’s business and occupation tax, which he called an insult to business owners. The council will discuss the possible legislative agenda items again at the Aug. 23 meeting. Published: Aug. 10, 2016, 3:55 p.m.